Soft, Disposable, Daily Wear, and Rigid Contact Lens fitting and supplies. Premier Optical Shop: Highest quality frames, lenses and service. Clay was originally from Mott, North Dakota, moving to Billings in 1960. He is a graduate of Billings West High School and earned a Bachelor of Science degree in Business Administration from Eastern Montana College in 1972. Clay has been in the Optical field since apprenticing with Kreiner Optical in 1969. In 1974 he passed his national boards for the American Board of Opticianry and is a Certified Dispensing Optician. 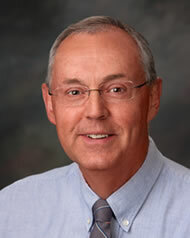 Clay purchased Kreiner Optical in 1980 and continued in retail optical until 2005 when he became the Optician on staff for Ophthalmic Associates of Billings. Clay is experienced in all phases of Optical, including the grinding of lenses, producing finished eyeglasses, product selection and dispensing to the patient. Continued education and keeping current with new trends and technology help him to meet the needs of our patients today and tomorrow. Clay is married with two children. His wife, Gerry, is also involved in the vision field as a Sensory Communications Facilitator for School District #2 working with the needs of blind and partially sighted children.